On the second day of Lunar New Year, Hong Kong TV King Ruco Chan (陳展鵬) will make another trip to Malaysia to greet his fans. According to the Meet & Greet’s promotional poster, the most expensive tickets are marked with a starting price of approximately HK$1,200, which even more expensive than some of the larger-scale fan meetings held by K-pop stars. Earlier, Ruco and his girlfriend Phoebe Sin (單文柔) were spotted doing some volunteer work together. In regards to their “date”, Ruco clarified that veteran actress Susan Tse () was supposed to tag along, but she caught a cold and had to be absent. Sharon Chan (陳敏之), who attended the same TVB event with Ruco, did not bring her 1-year-old son along as she does not want her son to get sick. As it is the peak of winter flu season, Sharon wants to avoid taking her son’s to places where it is too crowded. The influenza virus is much more transmissible in densely-populated areas like Hong Kong. “When I leave the house, I would always carry some hand sanitizer along, to protect myself,” she said. “I don’t want to get my family sick.” Asking if she considered the flu shot for her son, she said the controversy surrounding the latest flu vaccine has led her to go against the idea. “Right now, it’s important to look after what you eat and general hygiene,” she said. 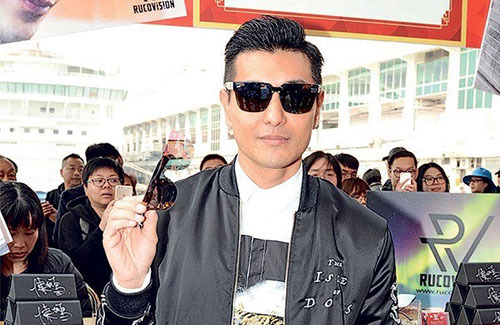 How dare that Ruco Chan to have tickets costling more than the K-pop artistes’ tickets. No wonder he is such a money grubbing, fame seeker. The more money he has, he wants more. The nerve of him! !, right guys and girls, no?. Lol. @bubbletea @passingby@funnlim I guess no matter how much fame and money he have, he will still crave for more and more. A greedy person like him will never be satisfied despite having everything. These pathetic, money grubbing fame seeker is probably going to spend the rest of his life chasing after fame and fortune. I think the most expensive is RM500 plus. Maybe need to plus tax? Still not cheap. He knows his worth but yes, maybe to some it seems like a money grabbing sort of activity which it is. He needs to earn the cash. Fans willing to pay. Supply and demand. No big deal. But even if I have the cash I won’t pay. Sheesh. No one has to pay that price at all. It is a misunderstanding. I find these silly fans and netizens see something and go wild before taking time to read and understand what is really happening. It will tough to endure a session like this when all you would see is the money signs in the eyes of the host throughout the duration. These celebrities have all admitted they go up to China for these ‘Meet and Greet’ sessions just to mop up the money. Felix Wong for example most of his income comes from these sessions since he is still known for his classics. Shirley Yeung has no methods to earn money so kept on attending these shows in China to squeeze out as much as she can. Ruco is no exception in this instance, the only difference is that this is held in Malaysia. Ruco will have to pay me good money to attend this. That’s for sure…. This is what i had pointed out in the previous post. Surely the publicity poster was clear enough. The misunderstanding probably arose becos some hk media not proficient in English saw the dollar amounts stated in the poster and jumped to conclusions. @passingby yes, I remember you saying something along those lines.Poor Ruco is getting trashed from all directions, lol. @bubbletea Sick and tired of hearing about this money grubbing, pathetic fame seeker on the news all the time. This guy is way overexposed and overrated, he should just look elsewhere to earn a living but not in entertainment industry. @funnlim @passingby @bubbletea I’m sure he is very addicted to the money, fame and attention the entertainment industry brings him. This money grubbing fame seeker is obviously only staying in the show business for the fame,fortune and high social status. There’s no doubt he would have quit acting a long time ago without his achieved stardom. @passingby Yup, you’re right, though sadly that’s how most things work nowadays….very few people actually take the time to read the fine print and understand the situation – instead, they see one thing and immediately jump online to gripe about it. In any case, regardless of the misunderstanding thing, I also wouldn’t pay that much for a celebrity meet-and-greet, even if it’s an artist I really really like. Heck, I wouldn’t even pay that much to watch a concert (of course the one exception being Jacky Cheung, who is worth every darn penny of the $511 USD I paid for my ticket to see his upcoming Las Vegas show). With that said though, I don’t fault these celebrities for making money this way, especially when there are fans willing to pay – some fans are satisfied merely getting a glimpse of their idol or being able to shake his/her hand, which I don’t see a problem with at all. I’m not that type of fan but I definitely don’t begrudge those who are. @llwy12 Nothing wrong with shaking a celebrity’s hand, having a photo-op, or seeing him/her up close and personal in the flesh. I am also going to Jacky’s Vegas concert in a few days too. Jacky is worth every penny for his concerts. You get your money’s worth and then some. @bubbletea Are you going to the Saturday show or the Sunday one? I saw all the fanvids and pics from the 3 Connecticut shows and got excited all over again! Hoping Jacky will do something special for the Vegas one, since it does fall on CNY….so jealous of the Singapore audiences who got to live feed with Wu Fung’s concert 2 nights in a row – that interaction between Jacky, Nick Cheung, and Wu Fung in itself was worth the price of those tickets, lol! Yup, definitely agree that there is nothing wrong with that type of meet-and-greet, especially for those fans who might only have that one opportunity to see their idol in the flesh, since concerts aren’t always easily accessible to everyone (I know a lot of Jacky fans who had to fight hard to get tickets to his concert and many who still weren’t able to do so despite jumping through many hoops). I think whatever suits their fancy, then go for it as long as they’re not harming anyone in the process. @llwy12 my concert date is the 17th. I love the MGM Grand. Have been to many an event there. You know, one can never get tired of seeing and listening to Jacky perform. There is dancing and props and and energetic entertaining in his concerts, but most of all, there is singing, which is why any fan who knows good singing is there to see and hear. The thing about Jacky is you can strip away all the glitz and glamour and still walk away knowing you have been entertained. That is not the case with most singers nowadays. @bubbletea @passingby @funnlim I’m sure he is very addicted to the money, fame and attention the entertainment industry brings him. This money grubbing fame seeker is obviously only staying in the show business for the fame,fortune and high social status. There’s no doubt he would have quit acting a long time ago without his achieved stardom. @killer02 much as I’m tired of you sounding like a broken recorder that keeps repeating the same tune, i have to agree that ” There’s no doubt he would have quit acting a long time ago without his achieved stardom.”. Any sane person would do unless he had a bottomless family fortune to fall back on. @passingby i TOTALLY AGREE WITH YOU. @blest62 @66ksc @bubbletea Sick and tired of hearing about this money grubbing, pathetic fame seeker on the news all the time. This guy is way overexposed and overrated, he should just look elsewhere to earn a living but not in entertainment industry. @passingby @bubbletea @janet72 I guess no matter how much fame and money he have, he will still crave for more and more. A greedy person like him will never be satisfied despite having everything. These pathetic, money grubbing fame seeker is probably going to spend the rest of his life chasing after fame and fortune. garbage HK media. They jumped to the prices which they assumed are ticket prices without checking the content, or they really don’t understand English? This shows they seize all chances to trash Ruco like some frequent visitors in forums. Worth or not, the passes were all redeemed in 1 day. TBB,s the one who’s most happy cos they have a money making machine. why is my poor RUCO not lined up with any new drama for 2018? just started watching 同盟 again these few days. i like the way Jazz killed off each bad character. I don’t know why everyone saying Ruco has no series lined up. Succession Wars definitely coming out this year. @jimmyszeto Ruco’s fans love to blow his trumpet lol. It’s amazing that for a guy who has failed for quite while, Ruco is still getting blindly bigged up. Any random actor can gain traffic in a mall…. @passingby maybe it is a nice trumpet to blow? @bubbletea you’re probably right about that cos the fans enjoy doing it so much (wink). @passingby lol, Indeed they do. @66ksc maybe if it was a stadium, Ruco would have still been able to fill it. It looks like Rover has come out to play. “Go fetch boy” throws frisbee. Really looking forward to your next edition of Grace/Kevin roleplay. You know the ones where you bully Grace and your relatives are proud of…..
Ah shucks, I must be losing my touch. I meant to say Buddy in my above post, not Rover, my bad, lol. Any of you familiar with the music of the late great, Bob Marley? IT is so ironic that I just finished listening to his song …Who The Cap Fits, Let Them Wear It. Nah..you aren’t losing your touch. Everyone has their off days… On a serious note though, when will you be releasing another one of those Grace/Kevin role plays? Maybe you could do a Ruco/Phoebe version?